Characterful, stylish and spacious restored Andalucian country villa with huge 10x5 metre swimming pool and breathtaking views over Lake Vinuela and the Mediterranean. Private and secluded, with beautiful gardens adorned with flowering climbers, jasmine and bougainvillea. There are lots of different terraces with sun loungers for reclining and lazing in the sunshine or under the grapevines, plus an outdoor kitchen with barbecue and Moroccan furniture for dining alfresco. This is a Mediterranean country villa, with wooden beams, whitewashed walls, original terracotta floors, handmade ceramics and antique rustic furniture. The bedrooms are very comfortable, with king size beds, feather pillows and Egyptian cotton linen and towels. The open plan Kitchen Dining Room is 55m2 and equipped with range style cooker, dishwasher and chrome fridge freezer, and the lounge with squashy sofas has a music system, dvd, and old family library with hundreds of books, films and CDs to cater for all tastes and ages. We can organise excursions including horse riding and guided walks, plus reservations at the Alhambra Palace and Malaga’s Picasso museum. There are excellent local restaurants/tapas bars close by, and we can arrange a local chef to prepare picnics and special meals. Aromatherapy massage is also available, and if there is anything else we can do to make your stay more comfortable just let us know – we are happy to help! Wildflowers, butterflies and birdlife, no traffic, yet only 5 mins to local village of Periana and half an hour from the beach. Close to Malaga/Granada, both with international airports, and within easy access of sightseeing at the white villages of the Axarquia, the Alhambra Palace, Cordoba, Seville and Ronda. We moved to Spain in 2001 and have been renting our villa for self catering holidays since then. We live in the local area and spend our winters at Villa Amapola with our friends and families. Shane and I are married with one married daughter and an adorable grandchild, all of whom live locally. Shane is Irish and I am English, a Londoner born and bred. Before we moved here, Shane worked in social housing and I was a teacher. 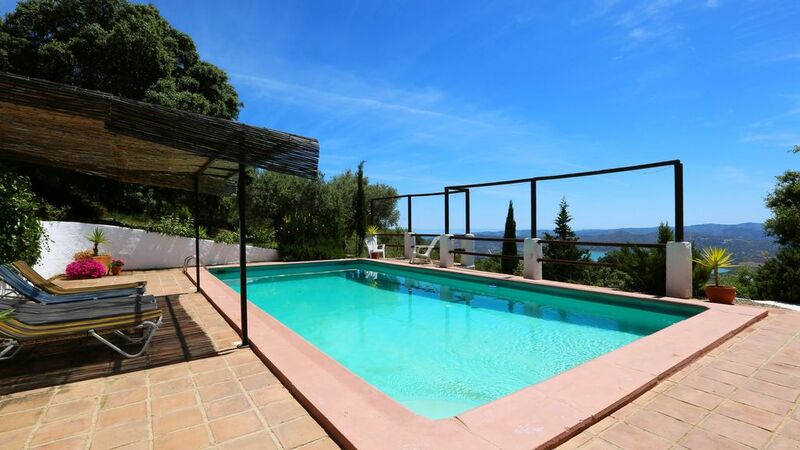 We fell in love with Villa Amapola whilst on a stroll from the nearby village of Periana. The fabulous countryside situation and breathtaking lake and sea views made it the perfect villa - exactly what we were looking for. Although set apart from the village and totally unobserved by neighbours, the villa is only a few kms from Periana, 15 mins from Lake Vinuela, half an hour to the beach and an hour to Malaga and Granada. Some of the unique features of Villa Amapola include its secluded and tranquil location, its gorgeous panoramic views in every direction, the wild countryside setting with amazing butterflies and birdlife and huge old olive and holm oak trees, the huge pool situated "on top of the world" - and the villa itself, spacious and comfortable, with its traditional rustic Andalusian style. Bathroom 1: extra large bath/shower over, wc, bidet, washbasin. Bathroom 2: en-suite to bedrooms 2 and 3 with walk-in shower, bidet, wc and washbasin. Fabulous huge kitchen dining room with high ceiling, wooden beams, stainless steel appliances, paella pan, raclette and masses of cookbooks for the keen cook. Library of literally thousands of books to suit all ages and interests! Hundreds of CDs, from flamenco to classical, from Jazz to Thin Lizzy! Lush fragrant gardens with jasmine, bougainvillea, rosemary and thyme. 10000m of private land with ample space for walking, running, exploring. Spectacular panoramic views of Lake Vinuela, the surrounding countryside and across the valley to the Mediterranean. More than 300m of terracotta tiled terraces shaded by grapevines and flowering climbers. Spectacular 10x5m private pool - large enough for proper swimming/diving and perfect for splashing about in! Set on the crest of the hillside with incredible views and amazing sunsets. We provide a welcome pack with a bottle of wine and some tapas, a selection of local maps and information leaflets and all basic staples such as tea and coffee are provided for your arrival. Local olive oil from our own olives, and specially bottled 'La Amapola' Rioja wine are available upon request. The property was more than we expected even better than the pictures. The villa was truly beautiful, well maintained, clean and spacious. Everything you needed was there even toiletries, there was a wonderful welcome pack so you could settle straight into your holiday. All thought out brilliantly to make your stay so special. The decoration of the villa is fabulous so relaxing, comfortable and authentic. We loved all the different outside areas, BBQ, court yards, seated areas, patio area under grape vines, pool and gardens. It is a one in a million property, very private, quiet and tranquil. All set in a wonderful area to explore. We have had a fantastic holiday at Amapola. The house is beautiful, the best we have ever rented! A nice pool, and the terrace with a view to the lake is truly amazing. The morning walks among the olive trees took us back 500 years in time. It is so peaceful and beautiful. We have enjoyed every minute! Stunning. Ticked all the boxes. We have had the good fortune to stay in several really lovely holiday villas but Villa Ampola tops them all. This a glorious and very sympathetically and tastefully restored property in the mountains between Malaga and.Granada. There are several outdoor terraces, we used different ones for breakfast, lunch,siestas,sundowners dinner, and lazing beside the lovely and good sized pool. This was a godsend when we became slightly overheated! The views from each terrace were breathtakingly beautiful, and so different, depending on the light of the day. The villa inside was beautiful also. Just my cup of tea! I just loved the size and space of the kitchen, the coziness of the lounge and bright spacious bedrooms. Beautiful double doors leading from the rooms to the outside spaces. The villa was comfortable,tastefully furnished,homely and welcoming, and absolutely spotless.Fantastic library for perusal also. We were given a very warm welcome by the very friendly and engaging owners,who were near at hand if we needed them. They gave lots of tips re good restaurants and places to visit. All in we could not fault our stay in Villa Ampola. It in itself was a beautiful space situated within the most glorious surroundings, easily accessible from Malaga airport and to the coast, as well as some interesting hilltop towns which are well worth visiting, and of course the wonders of Granada. Malaga old town also worth a visit. Wonderful produce in the market there. We had the most amazing week at La Amapola starting with a warm welcome from the owners and a lovely welcome hamper. The house is beautiful, tasteful decorated and furnished. The beds are really comfortable and the linen of high quality. La Amapola has the biggest kitchen in the world with lots and lots of bowls, pots and pans, sharp knives etc. We arrived in the dark and were all keen to see the view when we woke up in the morning. What a view, just amazing, we spent many hours just sitting on the veranda listening to the birds and stillness and looking out of the moutains and lake. Really spectacular! The Wi-fi worked really well which was a bonus to all family members who are unfortunately addicted to social media. The selection of books and videos is huge. The evenings got a little chilly, so we would light the fire and cuddle up in the comfy lounge watching a really good movie. We all went for a good rest and that is what we got, one week wasn't long enough though so we will have to return and stay for longer. The area is really lovely too, with a great restaurant in Periana, good value, lovely food and huge portions. We would highly recommend La Amapola to everyone. La Ampola is a lovely home in a breathtaking location, beautiful, peaceful - the perfect place to relax and get away from it all. The house is full of character, comfortable and homely with everything you could need, including loads of great books. Situated in proper rural Spain, there are lots of real Spanish villages and bars to explore giving me loads of opportunity to practice my Spanish! We loved that you could step out of the door and wander anywhere, the peace and freedom was fantastic. Malaga was lively and interesting and full of culture when we felt like being back in the throng and then escaping back to the mountains. And we also took a couple of days to discover Seville. A wonderful holiday. Thankyou, we plan to come back. La Amapola is one of the best holiday villas we have every stayed in. No only was it in a gorgeous location with fantastic views, but the house was clean, spacious and comfortable. I particularly loved it for several reasons: one, as a keen swimmer I was delighted that the swimming pool is a decent size rather than a tiny dipping pool! It is situated on a platform above the villa with fantastic views and makes a great spot to have an evening sunset drink; two, as a keen cook I was pleased to see that the large airy well equipped kitchen is a main feature of the villa, which made cooking a delight and it leads right onto a large terrace for eating outdoors; three, while many holiday villas are rather ugly inside, La Amapola is beautifully decorated with great paintings on the wall and quirky individual features that made us feel like we we actually at home; four, the owners are friendly and helpful, which -amazingly - is often not the case with villa rental owners. I loved the nearby village, Periana and particularly the Verdugo restaurant which had a delicious and cheap daily menu. There were many walking trails and in late September it was cool enough to use them. We drove down to the coast also and ate grilled sardines with our feet in the sand. Heaven! All in all, this was one of our best holidays in Spain, ever. We are planning to come back as soon as we can arrange a date that suits us all. Torre del Mar is about half an hour's drive, a typical Spanish beach resort with sandy beach and beachside promenade with numerous ice-cream parlours, cafes and some wonderful seafood restaurants. Nerja beach is about 45 minutes drive, a very pleasant and pretty resort with cliff side beaches and little sandy coves and beachside walks, plus interesting shops and some inviting bars and restaurants. Malaga airport and train/coach station are an hour's drive and Granada about an hour and a quarter's drive. Car hire is essential (there are numerous car hire companies available to pre-book from both airports) and we can advise if required. 5km to nearest shops, bars, restaurants, banks, doctors, dentist etc. at Periana, a pleasant market village. 25km to nearest town Velez-Malaga and beach at Torre del Mar. Alhama de Granada 15km with hot springs, ravine and lake. Malaga 55km. Granada 65km Moorish city with arabic quarter and famous Alhambra Palace and gardens, Sierra Nevada 75km. Seville, Ronda and Cordoba are all available for a pleasant day trip or a relaxing night away. We welcome small children! We provide a cot and high chair, as well as a large selection of books, films, games and diversions for children of all ages. Small children can play safely within the walled courtyard which leads out from the main house, and the terrace has lockable gates to stop children from wandering off to the swimming pool unaccompanied. Recommended local attractions include Granada's arabic quarter and the Alhambra Palace, Malaga's Picasso museum and wonderful tapas bars in the centro historico, Cordoba's fabulous Moorish architecture, the beautiful Chorro Gorge, Alhama de Granada's hot springs and the lake at Beremejales. Andalucia is famous for its lively nightlife and colourful fiestas; carnival in February, Semana Santa in March/April and in Periana the annual peach festival, the olive oil fiesta and the fiesta of San Isidro during the summer months. Nearby Alcaucin holds a small but prestigious flamenco festival in August. There are a good selection of excellent local restaurants and pretty hilltop bars nearby, as well as some fabulous seafood restaurants on the coast. The nearest bar and restaurant is about half a mile away. A selection of delicious tapas and 'raciones' are available at the local bars - ask for our recommendations. We provide links for horseriding, cycling and bridwatching enthusiasts - please let us know if you are interested in any of these activities. Booking Notes: To make a reservation please call or email to check availability and request a booking form, or see our website where you can read our terms and conditions and print out our booking form. Changeover Day: Bookings are from Saturday to Saturday. Arrivals after 5pm and departures 9.30am, but we can be flexible about this! Notes on prices: All prices are inclusive of gas, water and electricity.